Despite the promisingly wide scope of the world wide web, the animated Ralph Breaks the Internet doesn't get to be about what it's about until the second half. The highly witty original was about appreciating the groove you're in; the sequel, for the first half, seems stuck in it. In this follow up to 2012's Wreck-It Ralph, the 8-bit ape-like video game crusher Ralph (voiced by John C. Reilly) is now BFFs with Vanellope (Sarah Silverman), but she's restless, bored with driving around the same sugar-coated racetrack in a candy car. Ralph's attempt to bring novelty into her game accidentally breaks the machine. As a result, the game will be carted off from the arcade to the scrapyard. As denizens of an out-of-order machine, Vanellope and her other girl drivers are homeless, or rather "gameless." But the management has just added a wifi portal to the internet. Naturally, the pair sneak inside. This cartoon version of the world of William Gibson is a lot cleaner than the real thing. It's a blue-white giant mall, stuffed to the gills with product placement for websites. Discovering a rare part for Vanellope's Sugar Rush game on eBay, Ralph oafishly outbids himself and ends up owing $20,000. He hunts this small fortune with the help of pop-up hustlers trying to grab internet visitors with clickbait ("These Child Stars Went to Prison") before learning that the secret to success is making viral videos. The cartoon wakes up when Vanellope wanders into a Grand Theft Auto landscape called Slaughter Race. She gets a bit of a crush on the dangerous leather-clad Shank (Gal Gadot), and loves the slummy, smoggy neo-L.A. they race their cars through. 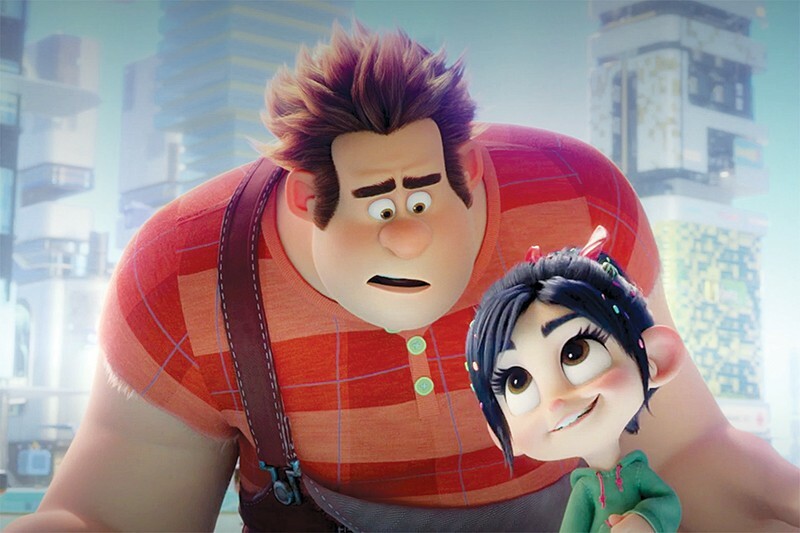 A great big man and a squeaky-voiced little girl buddy-buddying it in the immemorial Disney way may look a little strange, but here Ralph is revealed as an anxious parent worrying about an offspring going to the dangerous city and hanging out with sketchy people. This is a real hook, and easier to latch on to than simple adventures in a too-clean, too-safe internet, where promises are to be believed and personalities are easily monetized. 'Ralph Breaks the Internet' is playing in wide release in the North Bay.